Is the 'e' for 'euphemism'? This much I know: one should tread very carefully, and all the more so as a beginner, when talking about most things having to do with the care and training of dogs. These topics are every bit as loaded as politics or religion for their ability to explode in your face, hurt feelings, or get your own feelings hurt. At the very least, they invite someone to lecture you ad nauseam about the method to which they adhere and perhaps even why the one to which you cling that you foolishly volunteered for judgement just might just be from the bowels of Old Scratch himself. In addition to the emotionally-laden nature of it all, dog care and training are also as complex topics as politics or religion, with many parties or denominations (and sub-sects under each) vying for ideological supremacy over anyone who might venture down the path of choosing to make a canine a part of their family, or a working companion of some sort, or both. Everything about dogs seems to elicit a thousand different opinions and occasional heated argument: what to feed them ... or what to let them play with ... or where to let them sleep ... or leashes ... or whether and/or when to spay and neuter ... etc., etc., etc. But, I digress. Suffice it to say, it's all important stuff and people can get pretty worked up over just about anything to do with these creatures we all love and/or depend upon so much. So, on to today's controversial installment, inspired by a few days with Heather and Lincoln at a remote cabin in West Virginia after my grouse hunting trip with Justin and Chip and Chip's dogs: E-collar training. You can pretty much get a rough bead on where any individual dog owner stands on this particular topic simply by what they call the device that delivers small amounts of electric current (but also sounds and sometimes vibrations) to a collar on a dog as a part of their training regimen. Positive-reinforcement purists tend to call these things "shock collars," while those who aren't completely opposed to mixing in aversive stimulus will call them "e-collars" (and to answer the post's title question, the "e" is short for "electronic," not "euphemism," though I'm sure some would beg to differ). I very much lean in the direction of positive reinforcement, but I'm a purist about precious few things. "Moderate pragmatist" might best describe my modus operandi in a wide variety of areas. Ever since I stumbled across James Hilton's description of the operative philosophy of Shangri-la in Lost Horizon as a high school freshman, I recognized it as articulating, if not great and universal spiritual truth, at least my own disposition in personality: "If I could put it into a very few words, dear sir, I should say that our prevalent belief is in moderation. We inculcate the virtue of avoiding excesses of all kinds—even including, if you will pardon the paradox, excess of virtue itself." And so you might guess that while I am very much in favor of positive reinforcement, I respect those who will argue for some appropriate and limited corrections, or "punishments" (simply any stimulus effective in reducing a particular behavior). When it comes to e-collars, I very much see the need for them with hunting dogs, particularly when combined with GPS tracking capabilities. The romance of traditional locator bells not withstanding, I have no interest in forgoing the use of the combined GPS/e-collar marvel of modern science and thereby getting into a situation where I might lose Lincoln. For one thing, the singular and shattering tragedy of losing Lincoln on a hunting trip could very well immediately be compounded by Heather divorcing me - especially if my negligence led to my loss of our boy - and it would be hard for me to blame her. In addition to the GPS technology (less controversial), I also see the need for something that has the power of breaking through Lincoln's drive and excitement for the hunt by reminding him that I am there, and am asking him to do something that's important. Namely, for now, I am asking him to return to me when he is ranging out of my sight, over the next hill, where I can't be sure he isn't putting himself in danger. That's what the e-collar does, I think, in the best and most appropriate circumstances. It is a tap on the shoulder (or the neck, as the case may be), a "hey, pay attention" that has more immediacy than a voiced command and is much less likely to be lost in the wind or excitement or any number of things that might reduce a dog's hearing or focus in the presence of distraction. At its best, it is a simply a way to communicate with your dog over large distances. But, my mind remains open. If someone could demonstrate to my satisfaction that purely positive reinforcement methods exist that would just as reliably get Lincoln back to my side in hunting situations and in remote areas, I'd be a sure convert. But, for now, in absence of such a demonstration, I'll stick with applying stimulus with it with care in strictly limited situations. And, I'd certainly quibble with anyone who would suggest the e-collar necessarily and/or always delivers something that is properly described as a "shock," with all of its nastier connotations. I don't believe in inflicting a stimulus on Lincoln that I wouldn't be willing to bear myself and I can personally attest that the e-collar set on its lowest setting is virtually undetectable by me. Set on higher, yet still moderate settings, I can definitely feel it as a tap and the discomfort increases incrementally over its 18 possible degree settings. Lincoln has only very rarely required anything above a 4-5 on the 18 degree scale available on his e-collar to get his attention to a command. Often, he responds simply by voice command or a tone delivered before I start with stimulus at around a 3 (the level where he first begins to give indication of feeling it) paired with the voice command and only then increasing it by 1 for each verbal command given and not heeded after that. Care should be taken to always start back at a low level stimulus and work up to the level that produces a response. Individual dogs respond to stimulus differently and some are more sensitive than others. I have noticed I feel the levels differently on my own arm based on where I place the two prongs of the collar. The underside of my forearm near the elbow is sensitive to feeling anything from a 2 or above, while the meaty part of my palm at the base of my thumb is considerably less sensitive, often not feeling much, if anything, at 4 or below. Dogs are no less variable and also experience varying levels of stress between individual dogs, much like people do. All that said, I can tell Lincoln loves being off-leash and free more than he dislikes the occasional and very short nick stimulus received when he has the collar on, because, unlike his walking harness, I never have to convince him to come to me to put it on him. He understands when the e-collar comes out that he is about to be able to run free with only a request for periodic check-ins for me. His response to the e-collar is roughly equivalent to me taking out a Kong squeaky tennis ball: great fun is about to be had! But, I would be completely irresponsible if I didn't state clearly that one can get into danger easily with these devices in 1) unintentionally abusing a dog with them - especially by not consulting trainers and experts to teach you how to use them properly, and 2) in thinking they are somehow magic wands, that you can just push buttons and your dog will immediately understand what the bursts of stimulation mean without rigorous training leading up to their use with any given dog. When in doubt with an e-collar, never, ever experiment with your dog. Consult a trusted and competent trainer. Always. Good trainers will help you understand that the e-collar is simply a replacement or stand-in for other dog training devices, like a check cord, and that you have to use those other devices and a period of training first, before moving to replace the device with the e-collar - which only really allows you to replicate and extend the effects of those other devices over distances that wouldn't otherwise be possible. For instance, to teach a dog to come, you'd work with her or him first on a check cord, helping the dog to understand that an appropriate tug simply means "come to me," using whatever reinforcement techniques are used along with the check cord, often treats, clickers, etc. in the beginning stages. Only after the command and the action you are asking him to do are understood completely by a dog can you move on to replacing the check cord with the e-collar, using the same commands. Therefore, when you work in the e-collar, you are not shocking the dog into submission by any stretch of the imagination, rather, you are seeking to produce the same effect as a tug, nudge or tap with another device to say "hey, pay attention, I'm asking that you do something" or "I'm concerned you're ranging too far, I'm calling you to come back and check in," etc. Lucky for us, Lincoln's first trainer had him for a full month of an awesome puppy camp in September and helped establish the foundation for us for e-collar conditioning, working first with a check cord and verbal commands and had already successfully transitioned him to the e-collar by the time we picked Lincoln up at the end of camp. So, this work had already been done for us. All that was needed from us was to keep practicing and reinforcing the great training he'd already received. 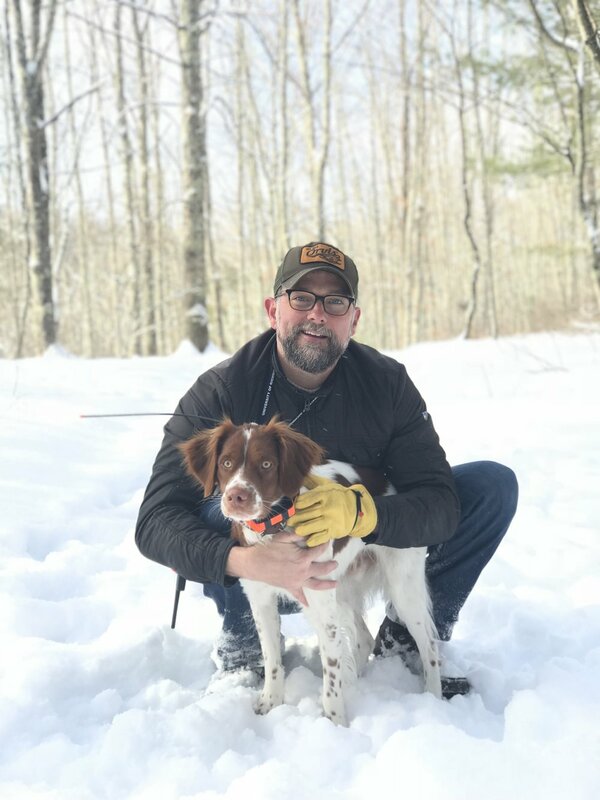 After my grouse hunt in West Virginia with Justin, Chip and Chip's dogs, we were joined by Heather and Chip's wife, Caren, to enjoy Snowshoe resort and the surrounding environs. Heather and I then spent a couple idyllic days in a remote cabin surrounded by thousands of acres of undeveloped land with our boy, practicing all these things with several hours-long hikes in the woods in the gorgeous West Virginia Mountains near Snowshoe Resort. All of our time with Lincoln in those woods over the next couple of days was off-leash, working on recall and hold/stay/release, interspersed by long periods where Lincoln could roam as he pleased, all under our watchful eyes and with the confidence we could get him to come to us if he ranged too far or looked like he was getting into trouble. Heather's and my bones have always rested easier in the mountains, by a roaring fire, often with glasses of bourbon in hand. Adding our boy Lincoln to the mix, exhausted by miles and miles of a snowy twilight path, made it all the more sweet and I can think of few times we've all settled into quite that level of deep peace. The days and nights we spent there, though brief, stretched out in blissful indolence, untroubled by cell phone service or any other connection to the outside world. And there's the irony: that something as technological and thoroughly modern as a combo GPS and e-collar device would open us all to days spent in solitude in remote wilderness, delighting in the timelessness of our isolation and rare respite from all worldly care. Euphemism or not, I'll raise a toast to the modern miracle of the 'e' in e-collar, that tether of perfect witchcraft, which helps Lincoln know in his canine mind and heart that he's got his freedom to run and roam and explore, but, that, like some benevolent deities, we're always somehow mysteriously right there with him, even when he's over the far hill, to coax or clap him back from danger to a welcoming and steady hand or the warm embrace of the home hearth, back to love and care and nourishment and a soft place to lay his head. Were the beating heart of love beyond the heavy shadows of this world to reach out to me holding open such a divine necklace, I'd come running for it too. May he always experience it and us in just that way.